Rubble-strewn wasteland is his idea of beautiful landscape. His wild ways create fear and terror. As vehicle, at 30 mph exerts 800,000 psi… has short-range concussion bomb launcher. 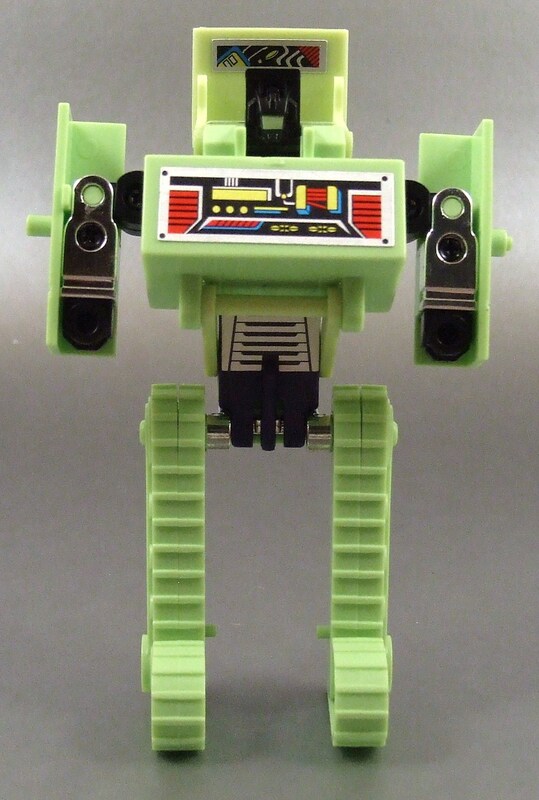 As robot, carries laser pistol. 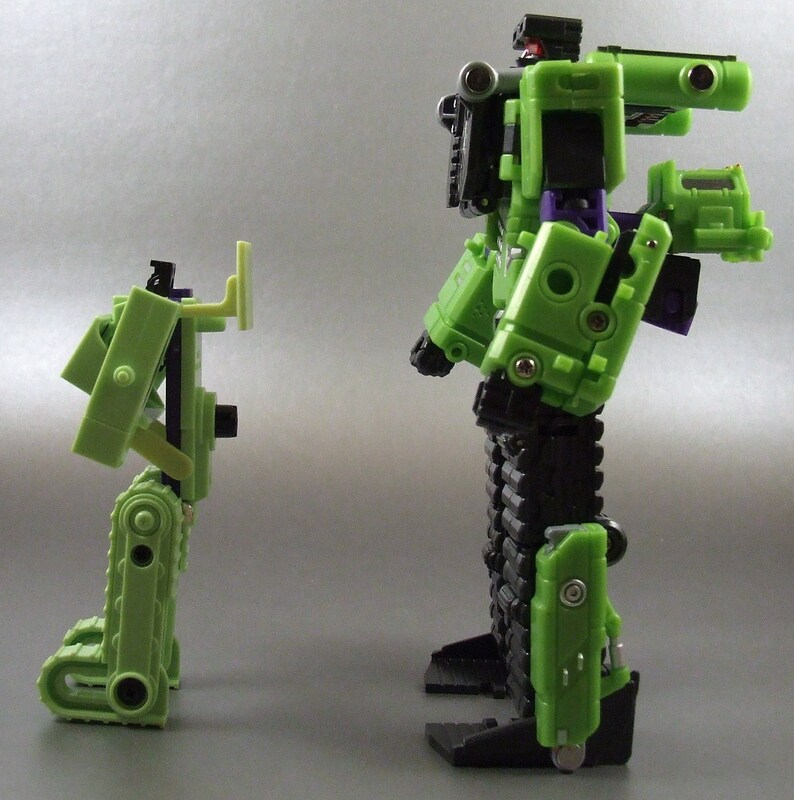 As left arm module, combines with fellow Constructicons to form giant robot “Devastator”. 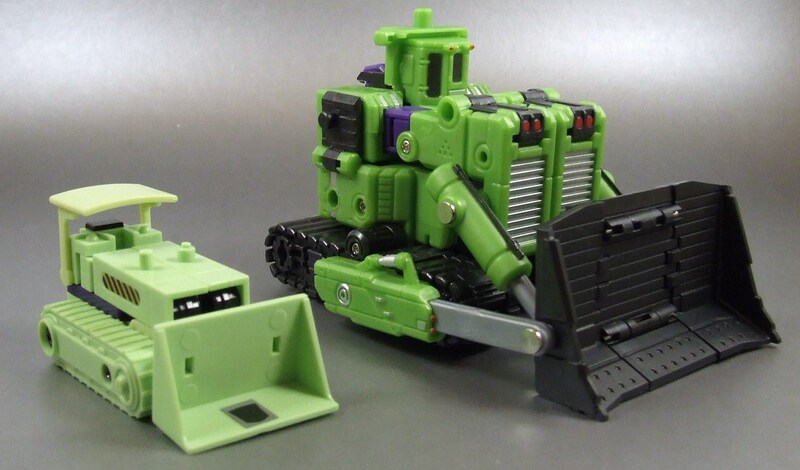 It’s the start of a 6 member team review and for my own personal collection there’s no better way to start it off than with one of my childhood toys: Bonecrusher. 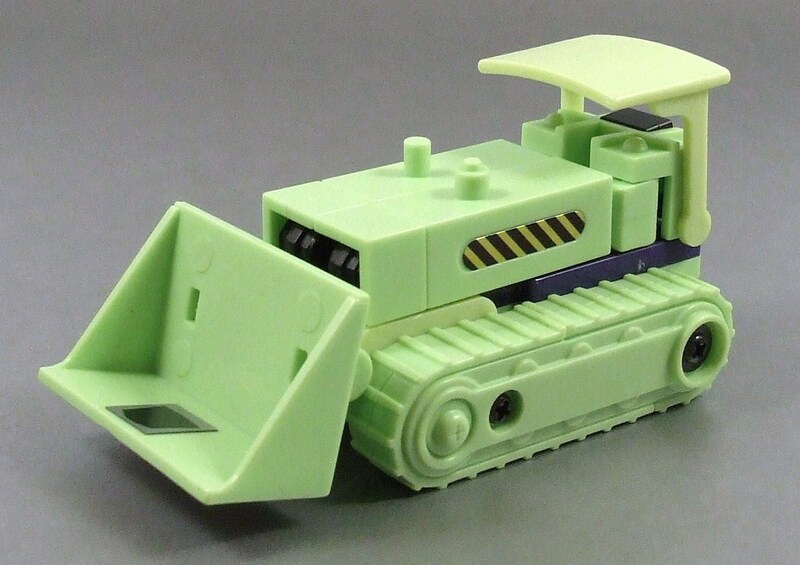 I actually had this Constructioncon growing up, but he was the yellow version released for the G2 line. 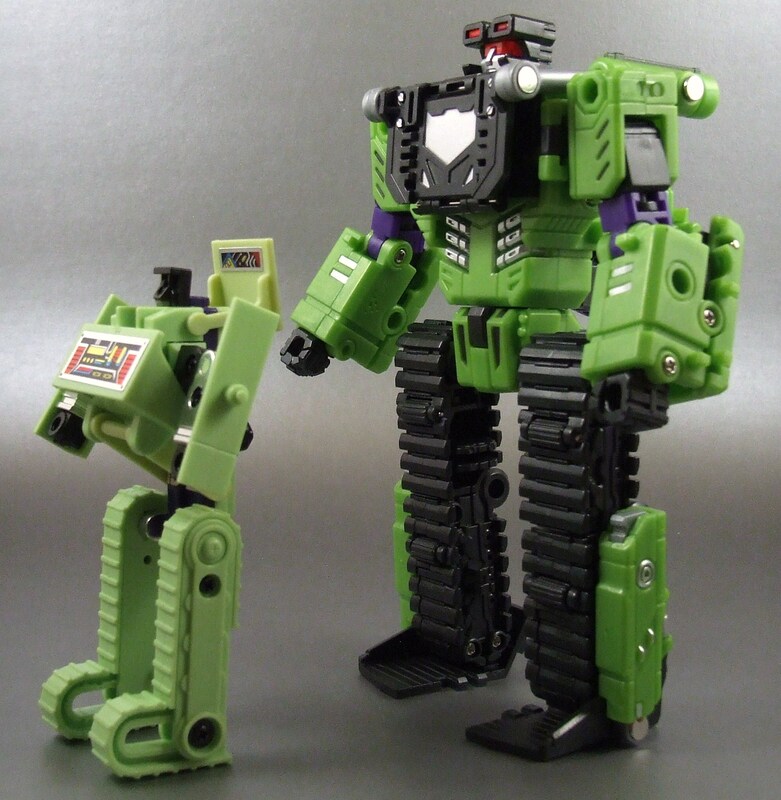 I recently had sold it off before I started this G1 Journey: to be perfectly honest I never thought I was going to complete a Devastator. 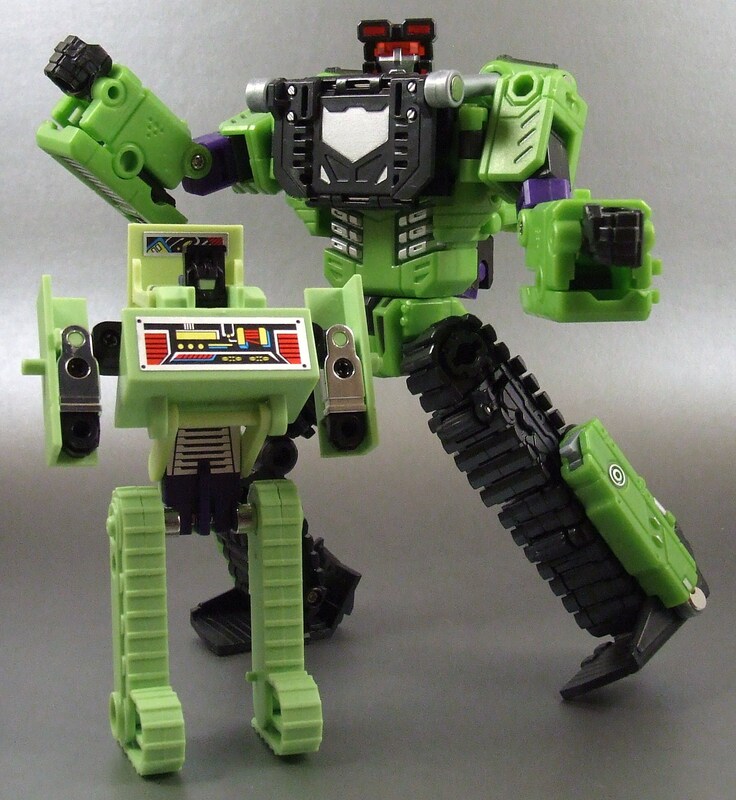 I’m thrilled I have Bonecrusher in hand and I’m happy he’s still fun as hell to fiddle around with. 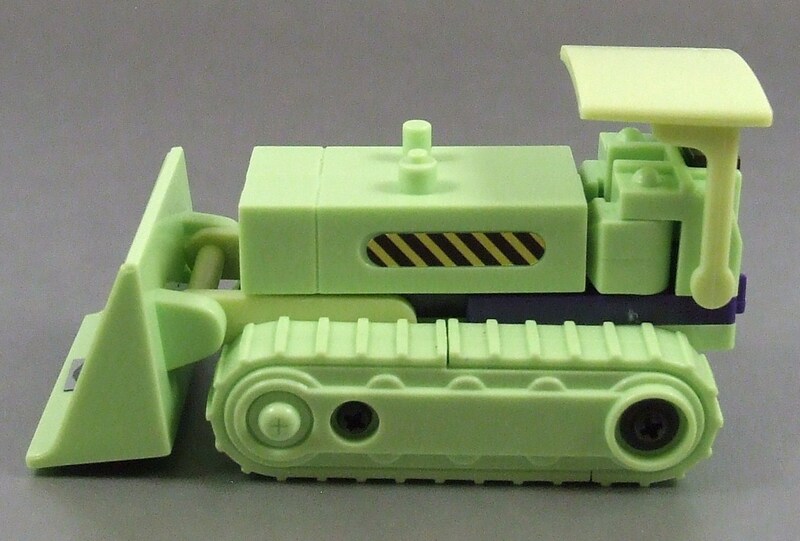 This post is all about the bright green Bulldozer, Bonecrusher. Phase 1 commence! 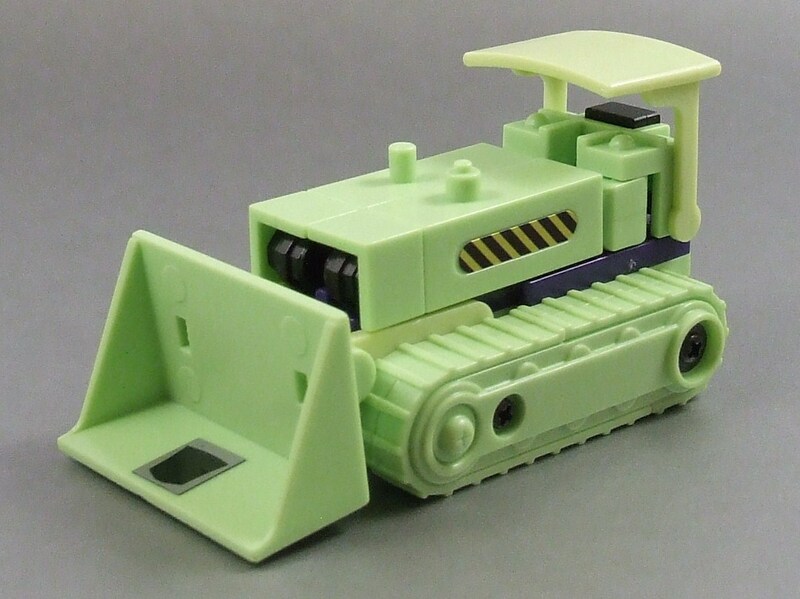 Bonecrusher has a Bulldozer alt mode and a pretty functional one at that. 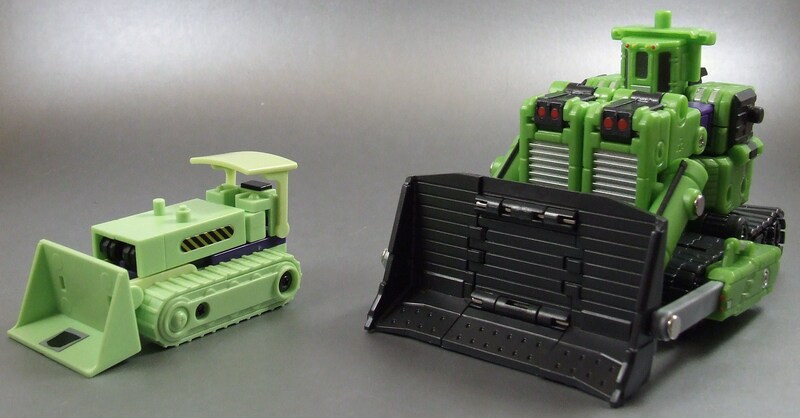 Although is has no rolling treads, which is probably the biggest pitfall of the alt mode, he does have a working plow. The shovel on Bonecrusher moves up and down a good amount of degrees to give you the ability to put in work during construction hours. The hood is also able to rotate downwards, but this is a function of transformation rather than functionality. 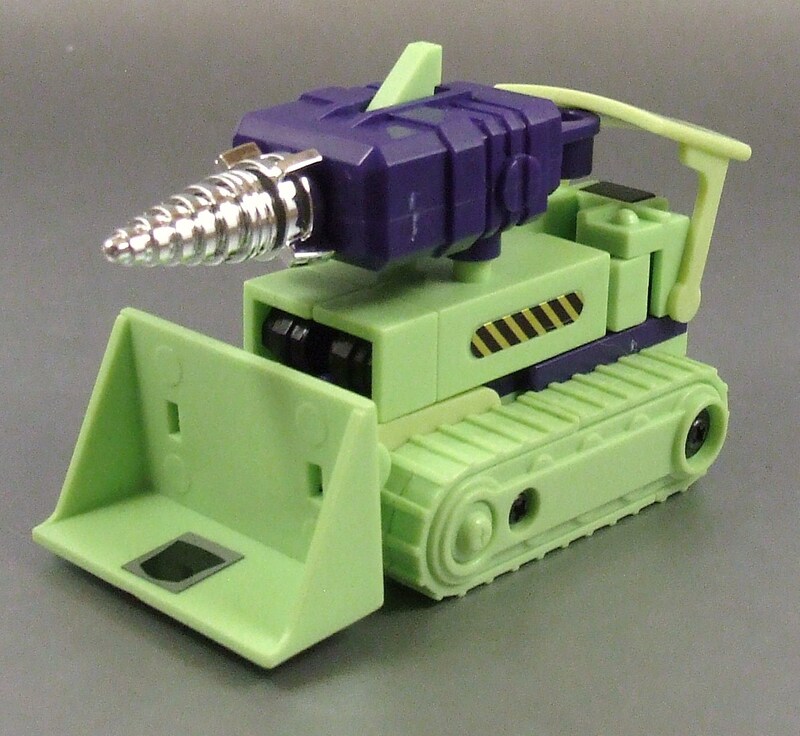 A very cool and probably unrealistic feature of this Bulldozer is the ability to attach a “drill weapon” on top of the hood. If you want to get really badass the drill also has the ability to shoot! A very cool feature, but something that seems a little too big on the construction vehicle. I think the best feature of alt mode is the well placed hazard stickers. 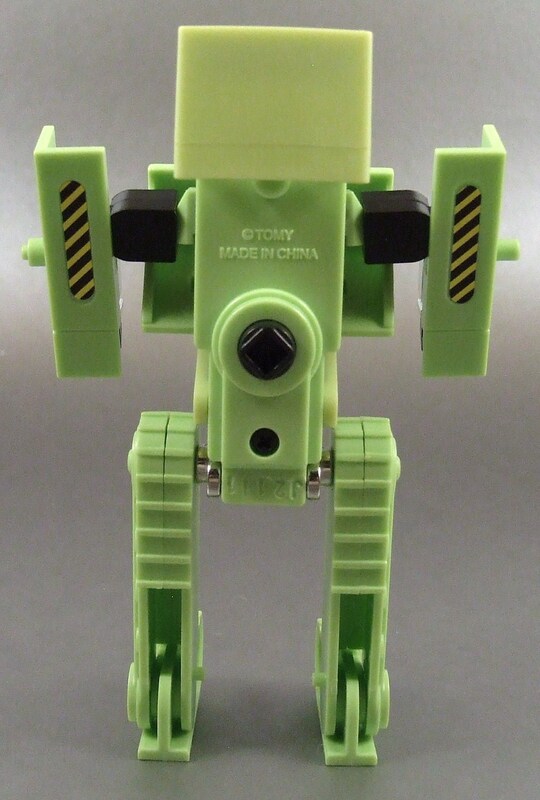 I opted out of a lot of stickers for Bonecrusher, but those hazard stickers were a must. 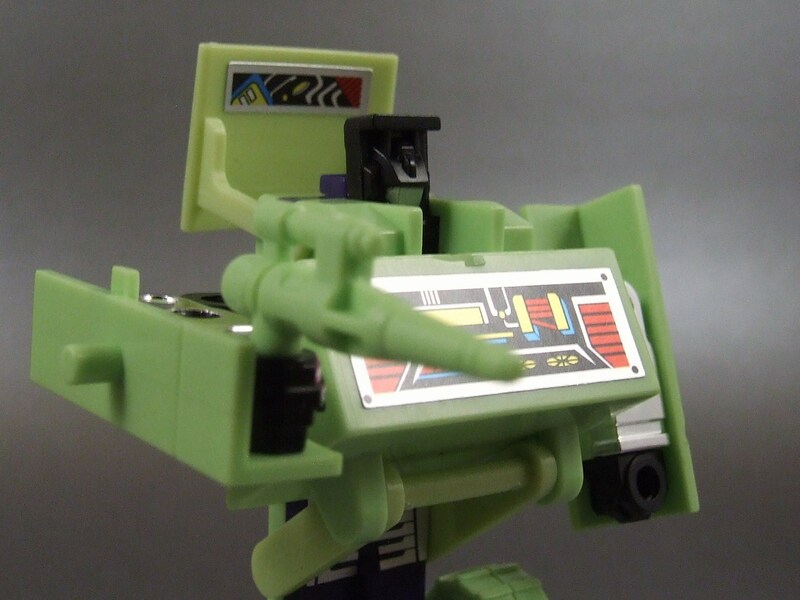 Although I enjoy the solid green deco with purple highlights, those hazards add a lot of character to the alt mode. All and all, the Bulldozer alt mode is a great mode for functionality and to play around with. I’ve always been fond of this particular transformation. It might be a bit of nostalgia, but I also think it’s just a very well done transformation sequence. 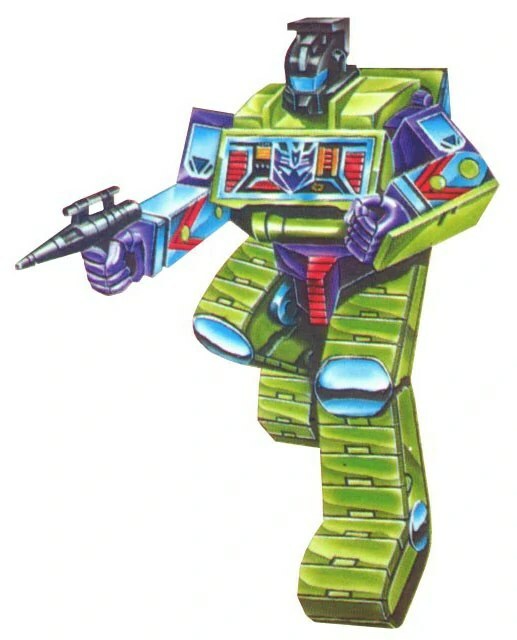 To start, Bonecrusher’s front half/engine piece will split in two to reveal his arms. 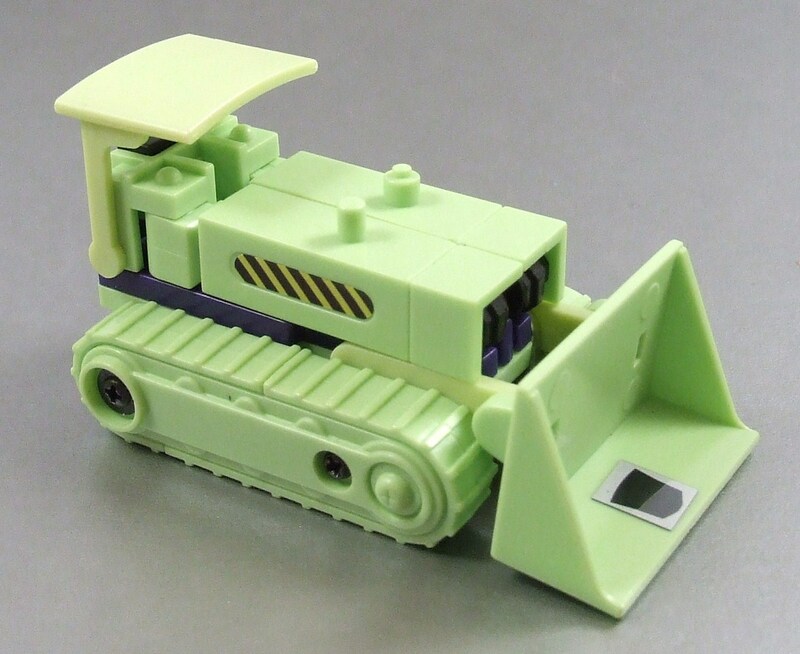 His shovel piece will then flip all the way up and over to become his chest. From there I’ll rotate the hood piece back and flip his head up. 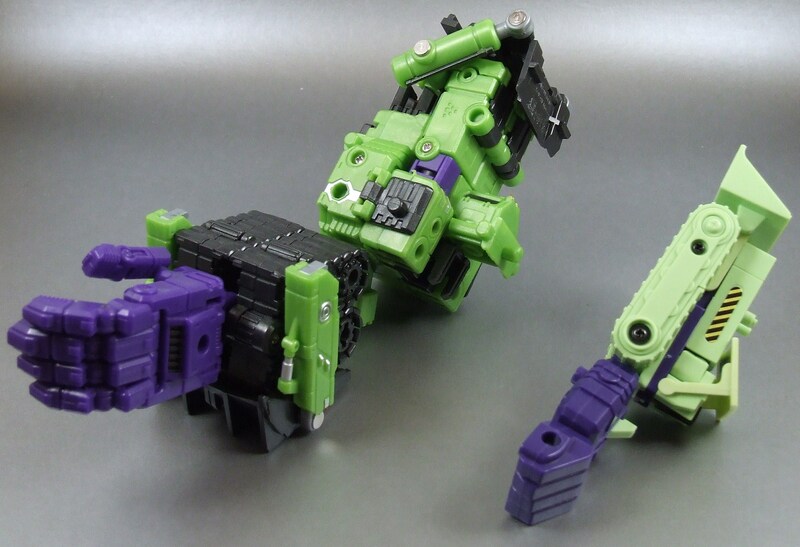 To finish things off, his treads will flip over to become his legs and then, this is my favorite part, his feet can be slid out and flipped 90 degrees. As I said, this transformation is a favorite of mine because although it’s simple there’s just so much going on to reveal his robot mode. Bonecrusher is pleasantly surprising in robot mode. 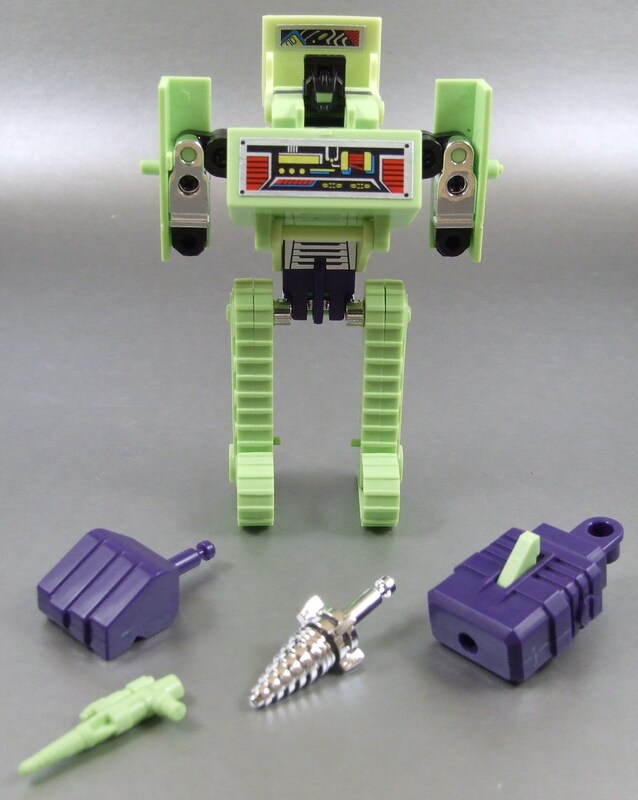 Individual combiner Transformers always seem to be somewhat limited in nature because they have to serve three different functions, but Bonecrusher has a solid robot mode. For starters, there’s a lot of great detail going on. 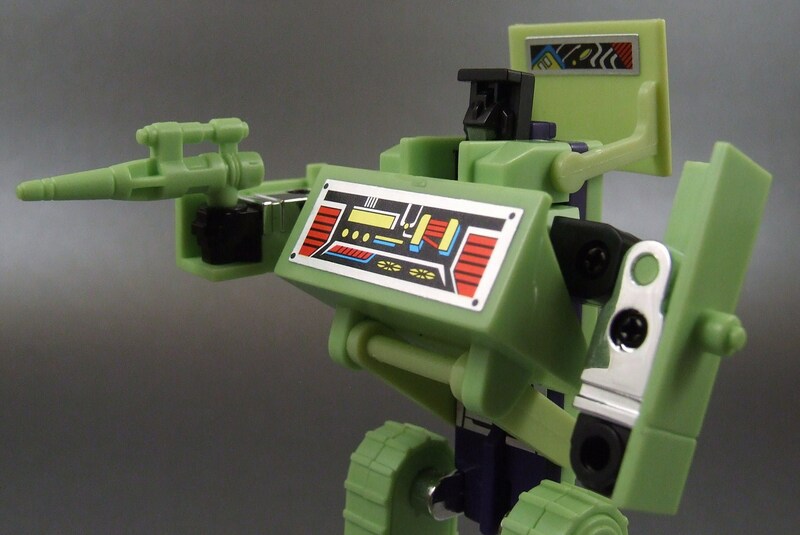 The sticker on his chest revealing a ton of technological gimmicks is great and helps break up the dominant green color scheme. 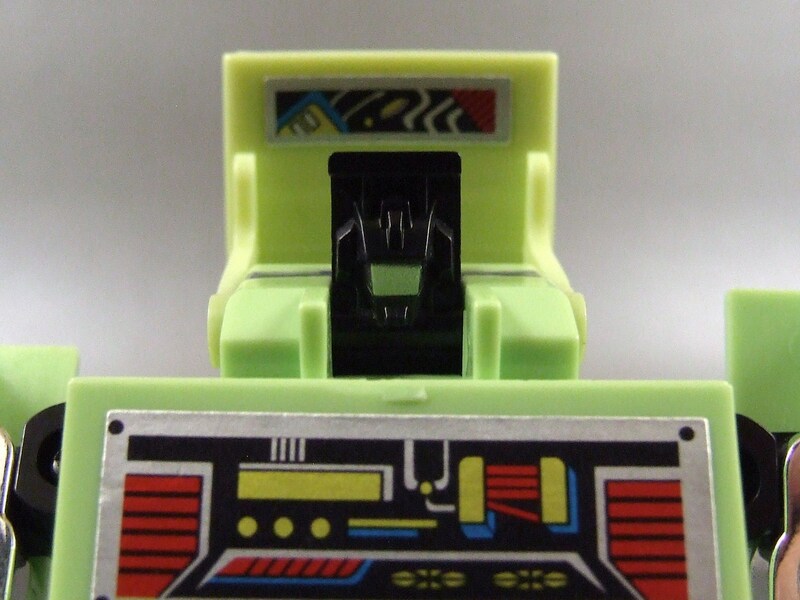 There’s also a well placed sticker on the inside of Bonecrusher’s hood piece sitting just behind his head that also has a great Cybertronian tech vibe. 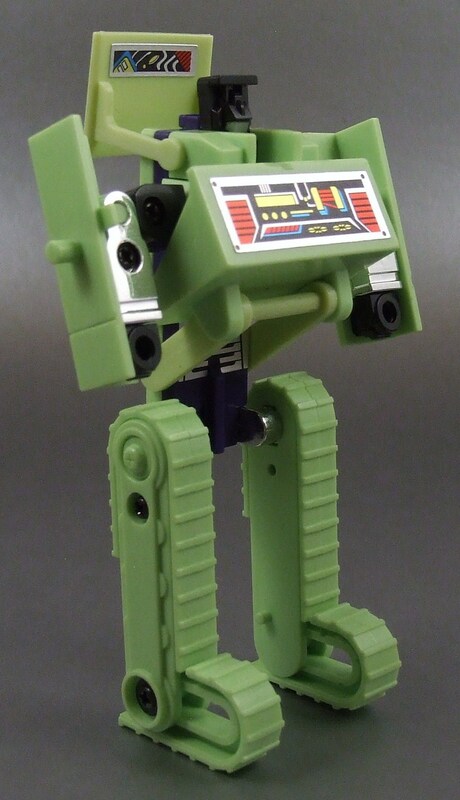 Bonecrusher also has a decent amount of articulation, a great feature for any G1 figure. 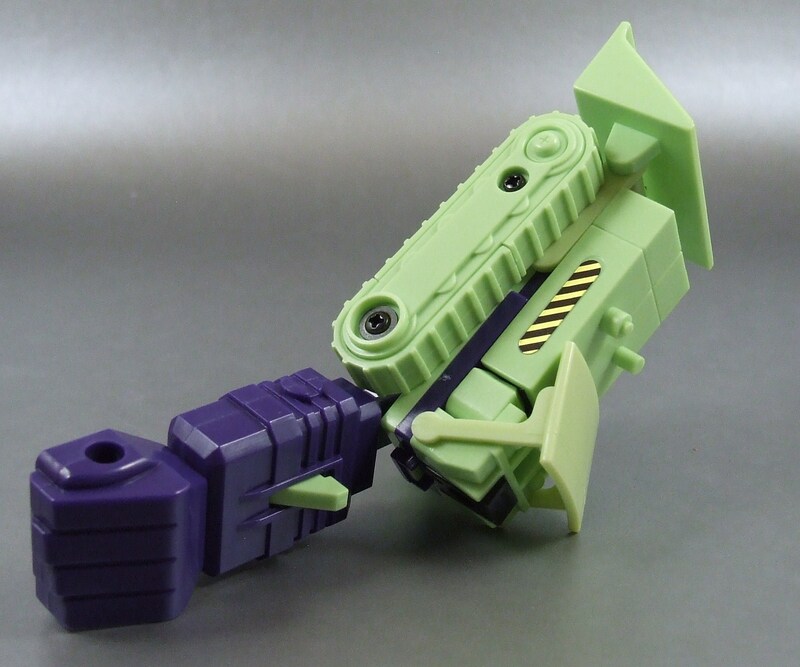 His legs are stationary, but his arms are able to rotate fully while being able to bend at the elbows so you can easily get some static gun posing. Robot mode is nothing less than solid with the great sticker detail and decent enough articulation. 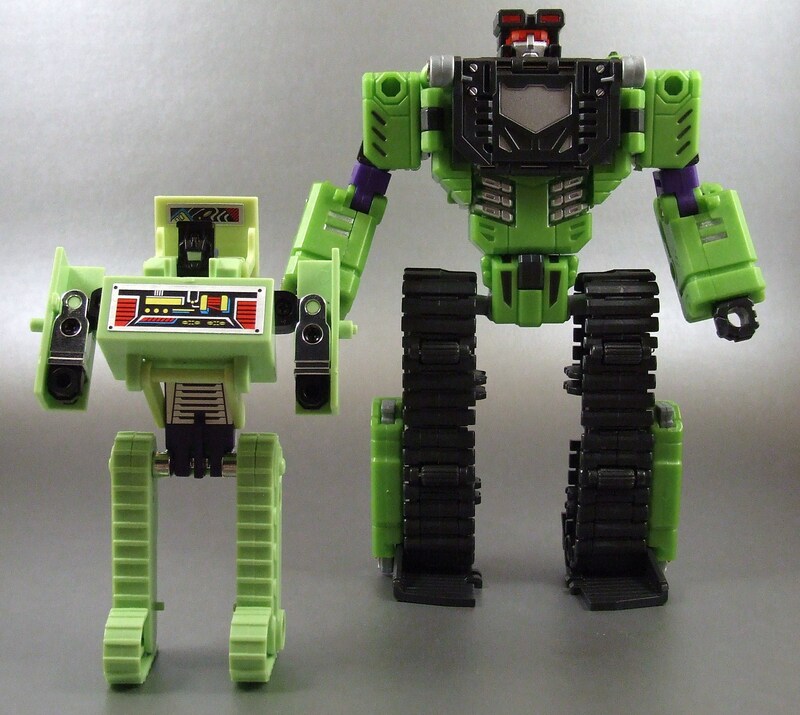 In my opinion, there hasn’t been a true official Classics update to Bonecrusher yet. 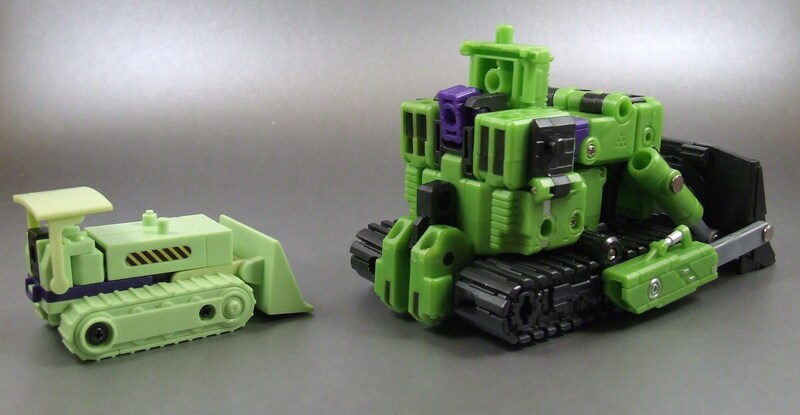 Hasbro released a Devastator giftset under the original Classics line, but the combiner team was a repaint of toys from the Energon line and I don’t feel like it’s a proper representation. 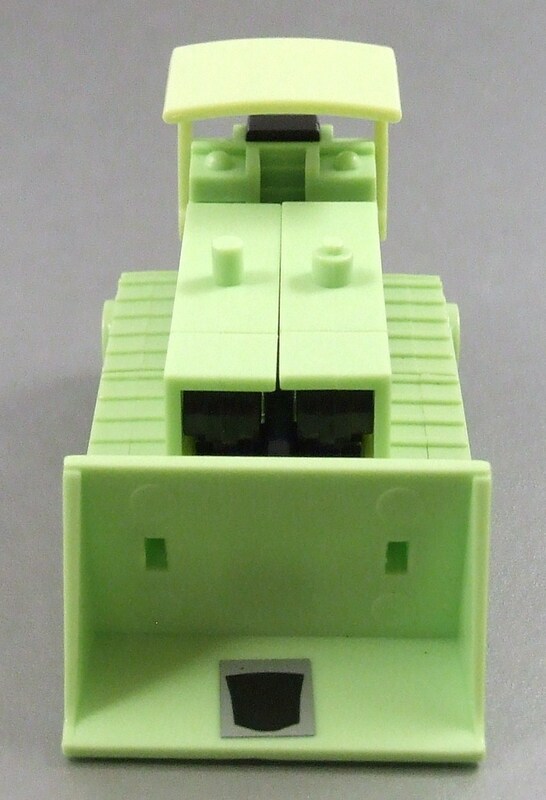 The “Classics” Bonecrusher I have in my collection is the recently released 3rd party TFC Neckbreaker. 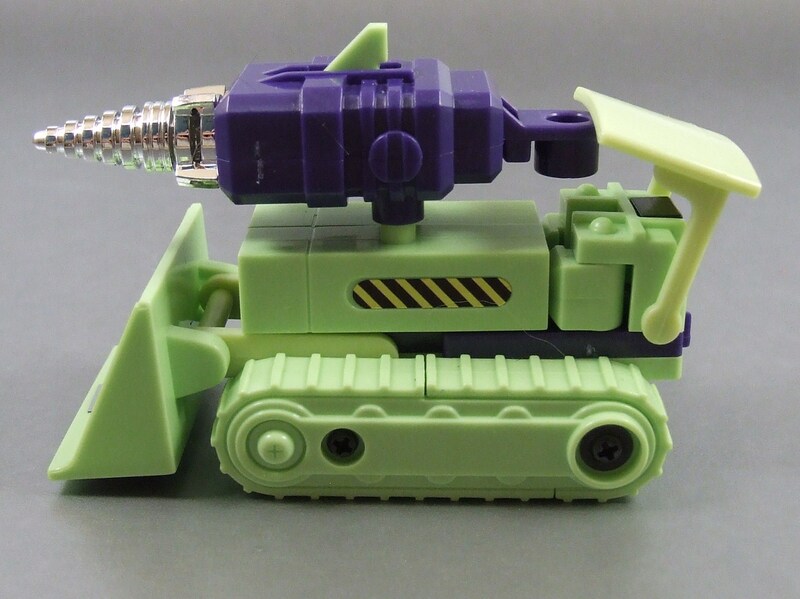 It’s my personal favorite of the recently released “Devastator” figures. It’s very cool to view this two figures side by side. 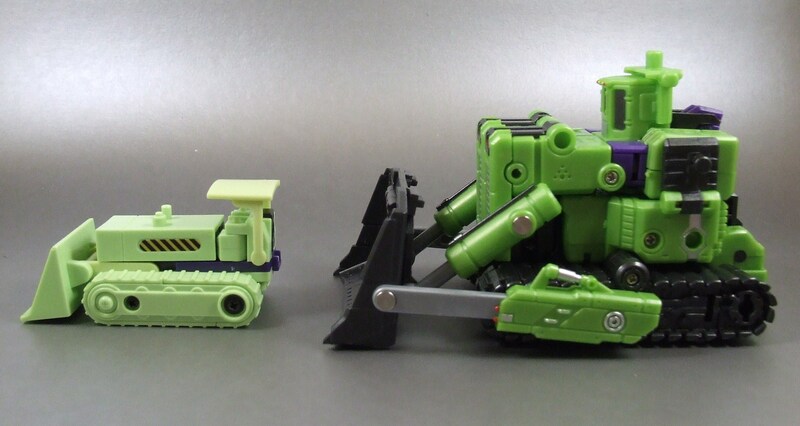 In the pictures you can see just how much of the G1 Bonecrusher silhouette Neckbreaker portrays, but you can also see the sheer size difference between the two Devastator limbs. Bonecrusher is a solid figure. He’s got a ton of play value mostly due to his construction vehicle mode. The robot mode is also no disappointment. 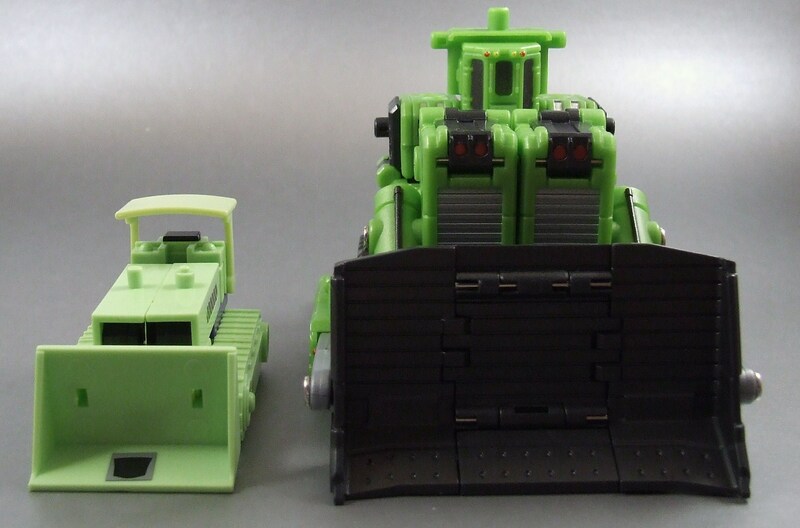 Bonecrusher has awesome and simple sticker placement, decent possibility, and the promise to be one cog in a much bigger machine; the anticipation is excitement in itself! He’s definitely a figure that won’t get boring after a few transformations.